... Well, that was then. Today the Trabant, Time Magazine's #27 all-time car, is beloved in Germany by the masses (who no longer have to drive it) for all its unique qualities. 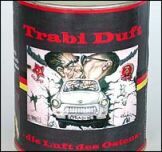 One Thorsten Jahn decided to 'can' the smell of a Trabant exhaust and sells it on his website. In a news report to the BBC he says, "The smell is something very special and scarce nowadays"... Price: 3.98 euros. Cans of "Trabant smell", priced via the economics of diamonds: Nobody has to have them, but if they are scarce and some people want them then there will be a price for them. 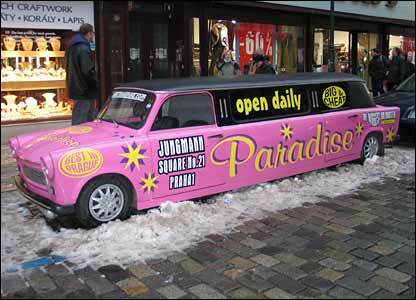 That smell is so beloved today that the Trabant has been exempted from Germany's tough anti-pollution laws. And it is not so scarce. Seventeen years after the last one was built, more than 50,000 are still on the road. 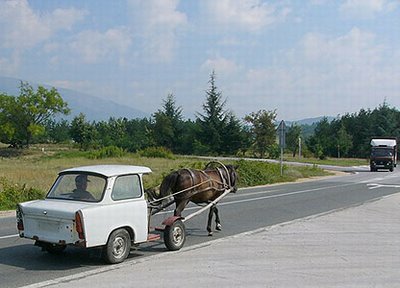 Trabants today cost from 1,000 to 10,000 euros depending on condition, these reports say. That's up to about $15,000 for a car somewhere between 17 years and 51 years old with a two-cylinder, two-stroke engine. When windmill repairman Martin Teucher drives to work before dawn, it's the thumping bass in his Trabant's backseat that keeps him awake, not coffee. The 24-year-old from the eastern village of Bruchmuehle has tuned his 1980 "Trabi", the smelly two-cylinder symbol of communist East Germany, into the hip-hop generation with a booming sound system and lowered suspension. Stuck to the plastic bumper is a placard reading "DDR". "If we put my car on the Alexanderplatz with a Porsche next to it everyone would ignore the Porsche"... [Reuters]. Trabant with optional full-horse power motor. 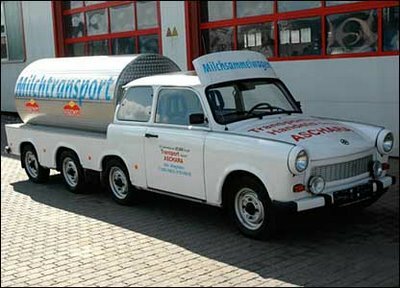 Trabant of the future? By 2011?